Our aim at Herschel is to keep enhancing our range with new technology & products to make it easier to stay warm, cosy & efficient. The new range of App-enabled iQ* allows you to create whichever heating schedule you wish from wherever you are, whether it be abroad or sat on your sofa at home. Our newly launched iQ App provides simple, easy to use, flexible control to suit your lifestyle – heating where and when you want it, wherever you are, through your smartphone or tablet. With Herschel iQ heating control its simple to ensure that your comfort levels are just how you want them whilst optimising the energy savings you’d expect from your Herschel infrared heaters. Incorporating the very latest EcoDesign energy-saving features such as open window detection and adaptive start plus highly accurate 7 day programming, all the benefits of electric infrared heating are available at the touch of a button. This control is ideal for returning from holidays to a warm home, pre-heating your holiday home getaways to guarantee a snug welcome upon arrival or for smart control of your office or commercial environment. We’ve also extended the iQ range to bring our new MD1 wired thermostat, below, to the market. Ideal for residential and commercial environments, the MD1 wired thermostat is particularly suited to new builds or renovation projects where cabling can be neatly hidden. Also incorporating a keypad locking feature, the MD1 presents the perfect solution for those commercial applications wishing to prevent unauthorised tampering of pre-determined settings, useful for care homes, hotels, student accommodation and landlords managing let properties. Download our Herschel iQ App*, choose which thermostat works best for you from our App-enabled range of options, add the iQ Hub and start saving on your heating bills today with energy efficient infrared heating from Herschel. 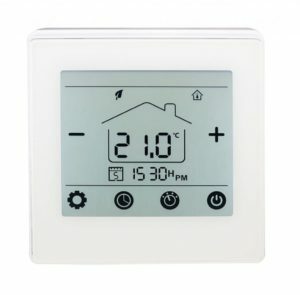 With a host of additional features within the iQ App too, including a share capability allowing control to be extended with colleagues as well as the ability to manage other hubs on the same App, it has never been a better time to move to Herschel Infrared and reap the benefits of radiant heating. Download the iQ App here on Google Play Store. Download here on the App Store. The future of heating today with Herschel Infrared. Herschel iQ is European EcoDesign (Lot 20) compliant. Herschel iQ has been specially developed for use with Herschel Infrared heaters only.